Our Kids Lab Coats are real coats just like the one your Doctor wears. Every little nurse and doctor should have one of these coats to complete their Doctor outfit. They come in many sizes and and are great for both pretend or playtime. These are real Lab Coats made from premium fabric and stitching. 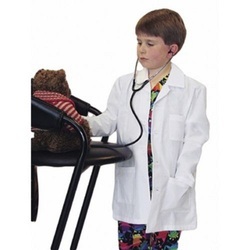 Your Little Doctor will love wearing this real Kids Labcoat. These Kids Lab Coats are made from top Quality materials. Landau Brand Kids Lab Coat in a size for the littlest doctors! Landau products are "Made Better"
Copyright © 2018 My Kids Lab Coat. All Rights Reserved.